The 2013 Dodge Dart was named a Top Safety Pick+ by the Insurance Institute for Highway Safety, despite the recently publicized problems with other commuter cars in small overlap impact testing. The 2013 Dodge Dart received a Good rating in all four IIHS crash tests, in addition to a 5-star safety rating from the National Highway Traffic Safety Administration. This makes it the third vehicle from the Chrysler Group to achieve a Top Safety Pick+ designation. "We are very pleased that the Dart has earned a Top Safety Pick+ designation," said Tim Kuniskis, President and CEO Dodge Brand – Chrysler Group LLC. In recent small overlap testing 6 of 12 vehicles tested received marginal or poor ratings in impacts. Among these were the Chevrolet Cruze and Sonic, along with the VW Beetle, all rated marginal. Also tested were the Kia Soul and Forte who rated poor, along with the Nissan Sentra. The Dodge Dart received an acceptable rating in these tests as demonstrated in the video below. The small overlap impact was at a speed of 40 mph. "In addition to its solid structure – the Dart's 68-percent high-strength-steel content ratio is one of the highest in the industry – the Dart boasts more than 60 safety and security features,” added Kuniskis. “They include 10 standard air bags, which is unsurpassed in the compact car segment." The Dodge Dart is generally regarded as a small car bringing exhilarating performance back to a small vehicle greater than the sum of its parts, partly due to its kinship with the Alfa Romeo line. At an attractive price point the little powerhouse comes loaded with cutting-edge technology and class-leading safety systems. The new Dart GT builds on that with a 2.4L engine, kicking out 184 horsepower on a sport-tuned suspension, gripping black 18-inch wheels, and featuring a 8.4-inch Uconnect Touchscreen display – a giant screen for a car this size. 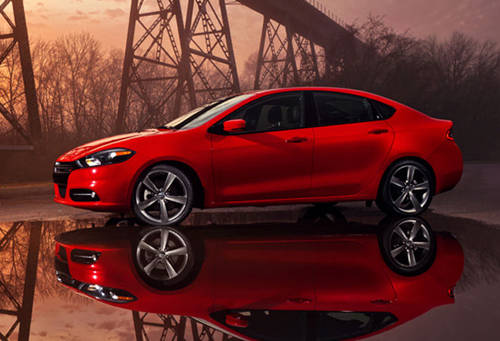 Throwing in hands-free Bluetooth connectivity and LED racetrack taillamps makes the 2013 Dodge Dart an unusual combination of power, efficiency, technology, style, safety and security for a base price of just $15,995 ($20,995 for the GT model). Add it all up and you have a fun to drive, safe and economical small car that gets up to 29-mpg on the highway. That’s a lot of little car for very little green – both at the dealership and the gas pump.